All that talk of replica cars in our last article got a lot folks writing in (thanks!) to share their own thoughts on the topic. It's fair to say there was a wide variety of opinions on the matter. Some still refused to think about driving anything but an original car, but a lot of you felt that they would make space in their garage for a high-end replica that truly felt very close to the real thing. I wasn't going to touch on the topic again for some time, but one gentleman posed an interesting question that I couldn't quite shake, and this article will serve as my answer. "Your points about replica vehicles were of great interest to me, but it would seem that even most replicas of a high quality are out of my budget. Do you feel that drivers like myself who have always dreamed of owning an iconic classic car could find something special in a more modest budget? I've got $40,000 to spend, and I can't find anything that really gets my heart racing." He really set me quite a challenge. Not because the budget is unreasonable (it's more than I've spent attaining my own classic car dream), but this just wasn't an area I was at all familiar with, so it required a bit of digging. As I scoured through the recent auction results online, I had to remind myself that I wasn't trying to find a nice non-original car under $40,000 - I was trying to see if you could buy a replica of an iconic design with that budget. Genuinely surprised at what I uncovered, I took a few days to decide which of the finalists would make the most interesting case, and the one I kept returning to was this D-Type. It sold for just $35,000 a few months ago. Go have a proper look over the photos below and get back here when you've made your mind up about that being good value or not. I'm sure I don't need to tell the vast majority of you that it's a long way off the real deal when it comes to being an accurate build of Jaguar's iconic creation. 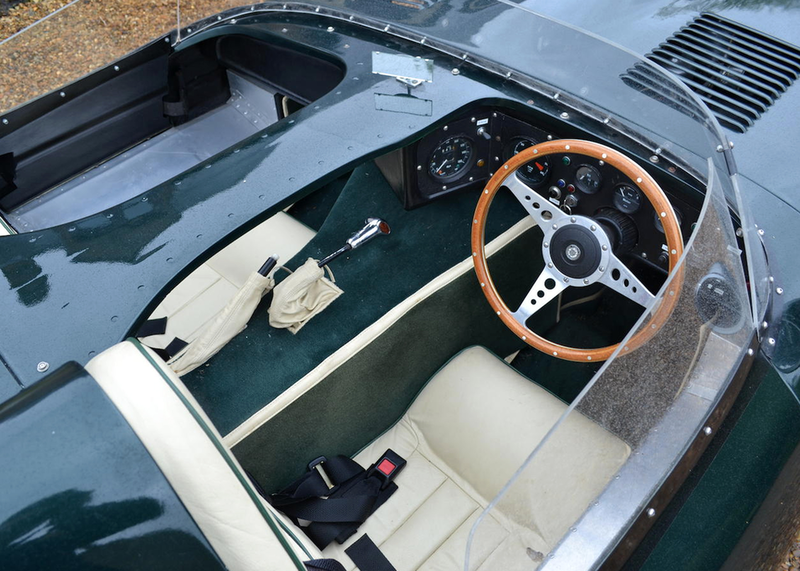 It succeeds in being obvious "at a glance" that it is styled as a D-Type, but then equally as obvious under closer scrutiny that it is not an original car. The thing is, you're getting a heck of a discount here over the original. This replica cost the highest bidder just one percent of the price you would pay to own an original car in today's market. I'll let you play spot-the-difference on your own and just say that although compromised in many areas, it still succeeds in being highly evocative of the '50s - and accurate or not, those incredible curves are just plain cool. It's entirely road-legal, with a clean MOT certificate. If you're unfamiliar with this British law, an MOT is a certificate given after a vehicle inspection by regulated inspectors, who then declare a car either fit for duty for another 12 months (as in this case), or unroadworthy unless listed defects are corrected). How would you describe it to your car insurance? I guess you'd tell them it's based on a 1983 XJ6 with the 4.2 XK engine, has a custom fibre glass body, adjustable dampers and a limited-slip differential, and is (of course) painted in British Racing Green. Given that it's already been registered successfully by the first owner and possesses a valid MOT, it's been classified by the government as "something" in the UK system, so the process to insure there is easy enough. Keep in mind that even replica D-Types can run over half a million dollars - and those 50 or so original road-legal cars Jaguar built to celebrate their Le Mans winning racers are changing hands somewhere near the four million mark these days. So assuming that your country or state makes it easy to insure one - is this car "close enough" at $35,000 to tempt you to own it? Only you can answer that, but what I know for sure is this. The people that placed the winning bid on this car are going to have decidedly more fun this summer driving their replica than they would have sat at home looking at photos of the real thing. I mean what can you really buy for $35,000 that is as good a conversation starter? Imagine that a new neighbor moves in across the street and they drive a replica D-Type - what's your first reaction? I don't know about you but I'd go around with some cold beers, wanting to get to know them. So if you're a social person, you might value that experience. Compared to say, buying a "sensible" decent-spec Volkswagen and being utterly anonymous when driving through middle-class suburbs.